Haiti Response Coalition meets at AUMOHD HQ | HURAH! 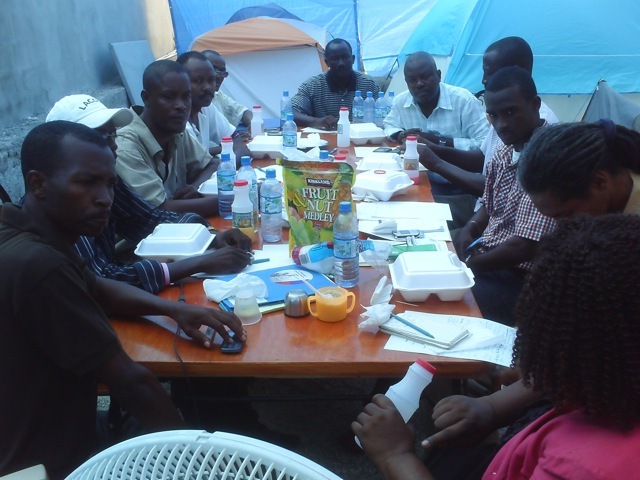 After a two-day retreat held at the Cannes à Sucre public park, the press committee of the Haiti Response Coalition (HRC) – a collaboration among Haitian progressive, social, and human rights groups – met at AUMOHD‘s meeting space. HURAH funds provided lunch and new tarps for the meeting. Leading Haitian human rights lawyer Mario Joseph and Djaloki Dessables, long time Haitian-American promoter and HRC co-coordinator, were among the many attendees. The HRC is designed to increase the influence of grassroots Haitian social justice groups over the decision-making processes of international relief organizations. The United Nations and other relief agencies have created dozens of NGO “clusters” that are essential to getting services to those on the ground. HRC will attempt to provide better access to these clusters.